Will the Third Intifada be Global? We are now entering the third week of the Gaza War. Israel’s IDF death toll is 25 and Gaza is over 500 (over 3,100 wounded). The vast majority of the Gaza casualties are men between 18 and 35, due to the precise and intelligent targeting by IDF. War is always tragic and devastating because one human life lost is always one too many, regardless of the side. The ground incursion–please don’t allow anyone to call it an “invasion”– started on July17 after Prime minister Netanyahu made a statement explaining the reason for such a move. Israel is officially at war and it could last weeks if not months. Hamas has rejected several offers for cease-fire and continues to fire rockets on Israel. One is to wonder why Hamas hasn’t built bomb shelters like Israel? The answer is simple: the bomb shelters are created by their own people whom Hamas sees simply as a valuable yet disposable commodity in their war against Israel. They protect their weapons with human lives while Israel protects human lives with their weapons. But by now we understand that Hamas isn’t interested in a military victory but rather in a media victory, proclaimed by a global media that has lost its moral compass years ago. The result, even though Hamas isn’t garnering the support they expected, is that the whole world is up in arms in support of “demon Israel” against “angel victimized Palestine”. And this is exactly what is becoming a great danger globally, well beyond the current tragedy of the Gaza War. We are seeing a recrudescence of destructive gatherings all over the world with Europe leading the pack in acts of anti-Semitism. To be sure, anti-Israel demonstrations are not a new thing and are part of people’s right to exercise their freedom of speech–within reason of course–and I believe that reason is long gone! The result is what we have seen around the world in the last 10 days so far. This convergence of anti-Semitic riots all over the world could very well be the “Third Intifada”! But wait, I thought that Intifada was a word meaning “uprising” in the Middle East and mostly by Palestinians against the Israeli “oppressor”? Well, it certainly was, but under the new anti-Semitism, the global Jew has become guilty by proxy. When a group of pro-Hamas protesters in Paris two Sundays ago decided to converge onto the Don Isaac Abravanel Synagogue, rue de la Roquette and attack it in “Pogrom” style putting close to 200 Jewish worshippers at risk, they showed us something very clear. The Paris protesters were NOT PALESTINIANS and the synagogue worshippers were NOT ISRAELIS. The riots were purely anti-Semitic and the Gaza War was only used as an alibi for unspeakable hatred. Chants of “Death to the Jews” or “Hitler was right” are being heard across Europe and other countries worldwide. As a result, various Jewish communities are terrified for their own and are starting to make serious plan for Aliyah to Israel. Consider the current global temperature as we look at a few areas where Jews are targeted. France: One of the hotbed of anti-Semitism has seen an unprecedented rise in violence in the Greater Paris region, Lyon, Marseilles and of course the Jewish suburb of Sarcelles also known as “Little Jerusalem” where cars were lit on fire and public furniture was ripped and thrown at Jewish stores, very much in a “Kristallnacht” style of aggression. United Kingdom: A very active and usually extremely abrasive Muslim community is present in the United Kingdom. They are of course helped by the liberal left in their anti-Semitic endeavors. The last few weeks have seen a surge of anti-Semitism in Greater Manchester, Glasgow and London. We have seen people march on the streets shouting “Heil Hitler” or “F#@*g kill the Jews”. 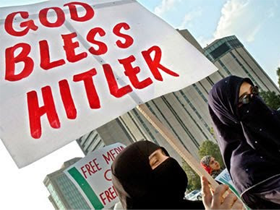 Germany: If there is one place where anti-Semitism shouldn’t resurface, it is Germany. Nevertheless, last Thursday you could see protesters on the streets of Berlin screaming “Jews, Jews, cowardly pigs, come out and fight!” This was followed by an unauthorized march of about 1,000 on Saturday that turned violent. Belgium: A few days ago in Antwerp, a street rally of pro-Palestinian activists had people shouting “slaughter the Jews”. Austria: 1000s of people marched in Vienna (organized by a Turkish delegation) chanting “Israel Terror”. United-States: In Boston, an anti-Israel “die-in” demonstration took place where the protesters fell to the ground in support for the Gaza victims and then read the names of the Palestinians who had died in that war (no reading of the names of the Israeli victims of course!). Slogans such as “Jews back to Birkenau” were heard. In Los Angeles a federal officer fired shots at a pro-Palestinian protester last Sunday. Similar protests, marches and riots took place around the world in India, Turkey, Indonesia, China, Tunisia, Greece, Korea, South Africa to only name a few countries. What must not be missed is the fact that many of those countries ARE NOT MUSLIM COUNTRIES, so what is their real motive for all the venom they spew? Additionally the reprimands given by most authorities had little or no effect and much of the “cancelled by the authorities” protests went on anyway, and continue to go on. These uprisings are only going to intensify in the coming weeks. This is a very good time for Christians around the world to show their support of Israel and their love for Jewish people. If this is indeed the onset of the “Third Intifada”, I am afraid that we haven’t seen the worst of it yet. There seems to be a concerted effort to go after the Jews, especially in Europe. While there is no sign yet of any clear organized campaign by the protesters against global Jewry, we can agree that the media is helping to promote anti-Semitism. They are way beyond drinking the Koolaid. As a matter of fact, they are themselves mixing a new batch to serve to a bigoted world. This global protest HAS ABSOLUTELY NOTHING TO DO WITH THE GAZA WAR AND EVERYTHING TO DO WITH GLOBAL ANTI-SEMITISM. Jew haters are using the Gaza War as an excuse, and for now it seems to be working. This is one more proof that we are now experiencing what I call eschatological anti-Semitism or the final battle against the Jews. For those of us who read our bibles and believe it to be the inspired, unchanging and living Word of God, we know that this battle is real and comes directly from Satan. We also know that God will not allow the enemy to win. While God cares for all human beings and doesn’t wish for any to perish, GOD WAS THE FIRST ZIONIST and I am on His side! Some Jews will leave, some will stay and some will even fight back. But all Christians should know better, speak up and get involved because the one thing Christians cannot afford to do is to become the new by-standers of this generation. Wake-up, the rubber has met the road!